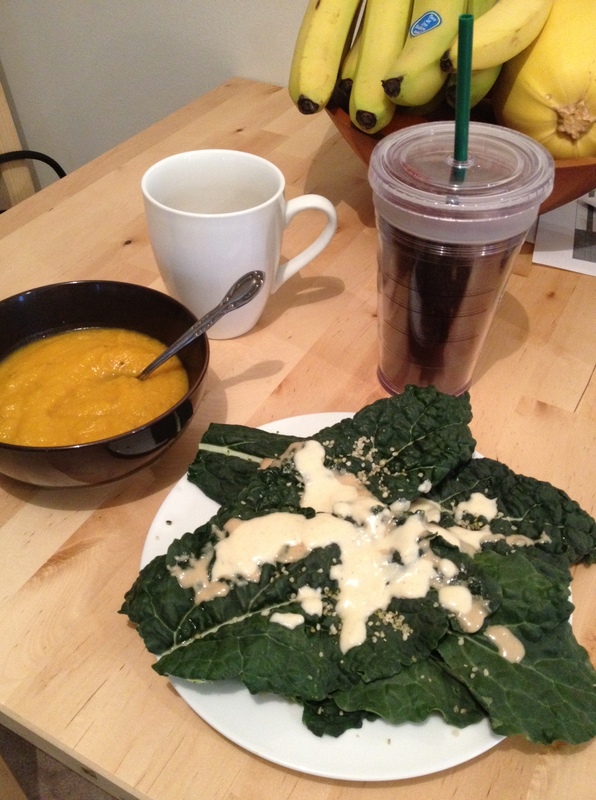 Beating the Winter Blues + A Yummy Salad Dressing To Get You Started! Is it just me or is this dark, dreary weather totally un-motivating? Studies show that around 2% of the Canadian population is diagnosed with Seasonal Affective Disorder each year. This form of depression strikes individuals during the darker, colder, and shorter days of the year. When I first read that statistic I was quite surprised; I thought for sure the number would have been higher, at least here in Vancouver where all we see is rain for five straight months. Okay, I’m exaggerating. There’s maybe a week and a half in that period where we are rain-free; we get maybe 3 or 4 days of wet snow and a few days of sun. But that’s about it. On a daily basis I encounter at least one person who claims to have SAD, (short for “Seasonal Affective Disorder”; perfect acronym, dontcha think?). plus an additional 10 that I secretly diagnose myself. So is why winter such a depressing season? What’s not to love about it? We’ve got the joy of the holidays, the aforementioned weather, darkness when you leave for work, darkness when you come home…Hm. I seem to have just answered my question. So what does one do when there’s nothing you can do about the weather? Well for one thing you can buy this fancy little lamp to tote around all day that gives you a boost of natural sunlight. Online they range in price from $43 to $343. I’ve never used one so as much as I’d like to I can’t bash the idea of it, however I am a fashionista (in my own mind) and Happy Lamps just don’t coordinate with my outfits very well. You could try an anti-depressant, but with side affects such as constipation, diarrhea, headaches, nausea, gas, bloating, fevers, changes in heart rate, loss of appetite, loss of libido, loss of hair, dry mouth, dry skin, increased sweating, exhaustion, difficulty sleeping, restless leg syndrome, gambling addictions, depression…..wait wasn’t that what we took the pill for in the first place? I think I’ll pass. What I like to do to ensure a happy winter is make some time for physical activity and eat lots of clean, healthy foods. Getting exercise can be easier said than done this time of year, especially when that warm bed and cozy couch look so inviting, but it is so crucial to keeping your serotonin levels high and your misery levels low. A common excuse for not exercising is being too tired. I’m not asking you to run a marathon or squat 180lbs here people (unless you want to, then give me a call!)! 30 minutes of light cardio is all it takes to get the good things flowin’. Go for a short walk if it’s not so wet outside you’ll drown; do jumping jacks during commercial breaks; throw some punches at the air. Anything to get you moving! If the thought of this seems too daunting, put on your workout clothes and commit to a five minute workout. Five minutes is nothing! You can totally do it. And chances are, once you start you’ll want to keep going. Clean eating is often overlooked as a mood-enhancer and hormone-regulator, which is unfortunate because the foods we consume can have a massive impact on our mood. When I consume too much refined sugar I feel sluggish, cloudy, and demotivated. Processed foods that are high in sugar and artificial ingredients wreak havoc on our blood sugar levels and can leave us feeling unsatisfied and hungrier than before. And trust me. I am not in a good mood when I’m hungry. You may be asking yourselves “what exactly is clean eating?” While there is no standard definition, a general rule of thumb is that if it’s free of added sugar, sweeteners, and other artificial ingredients, and has minimal ingredients on the label (or even better, no label at all!) it’s probably clean. Foods that are as close to the way mother nature intended as possible are the best choices to keep you feeling refreshed and energized. The good news? Many of your favourite winter foods can be lightened up and made clean quite easily! There are a ton of resources online that provide recipes for clean comfort foods. One of my favourite magazines, Clean Eating Magazine, has a HUGE database of all of their recipes on their website. Now for the bad (but not really bad) news. Eating clean can take some time and planning if you’re not used to it. I find it helpful to take some time each week and plan out some healthy breakfasts, lunches, dinners, and snacks. I may not always make a full-on meal plan, but I’ll have a list of clean meals prepared and all of their ingredients stocked and ready to go so there’s no excuse for eating poorly! The more you practice and the more you build your own repertoire of clean recipes the easier this will become, so try to stick with it for a while. Check out this dinner! 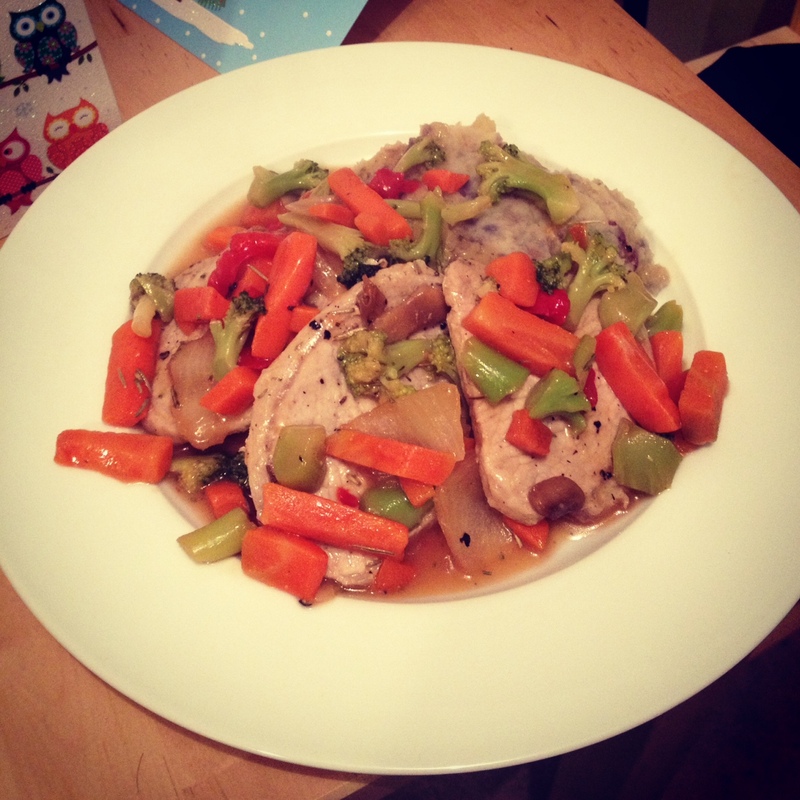 Pork, mashed potatoes, veggies….sounds like something mom would have made for dinner on a cold night, doesn’t it? Would you believe that this entire dinner has only 6 ingredients? Well it did (if you count a bag of frozen mixed vegetables as one ingredient). And it totally satisfied my craving for cozy comfort food. So give it a shot! I guarantee you will notice an improvement in your mood this winter by incorporating more natural foods into your diet. 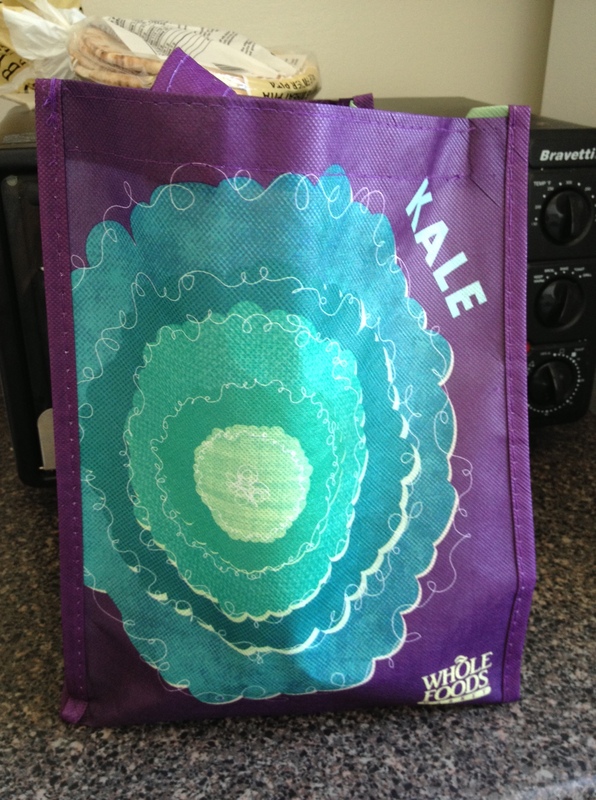 My current object of affection is KALE! That lovely, fiber-riffic, anti-inflammatory, antioxidant-rich leafy green. I’ll eat it massaged with a little bit of antioxidant oil in a big beautiful salad, toss it into soups and stews, and as of yesterday, make caesar salad with it! Whole Foods had a 2-for-1 sale for black kale which I had never tried so I obviously walked out of that store with a couple bunches in my bag (which conveniently has kale on it..cute, right? Or kinda lame, one or the other). Anyways, the black kale leaves reminded me of big romaine leaves, and I had just bought some tahini that I needed to turn into a creamy dressing, so I decided to try to make my own version of caesar salad without the fatty, chemical-laiden store-bought dressing I used to love so. Annnd it was a success! It had that nice tang that caesar dressing has, and when I asked the man of the house to try it (who is not a fan of caesar salad whatsoever) he scrunched up his face and asked “is there fish in this?” Nope! But mission accomplished. Give this easy dressing a shot! It’s a great way to play up your raw veggies and makes you feel like you’re eating something deliciously bad for you. Puree all ingredients in a food processor, refrigerate, and enjoy! I ended up with about a 1/2 cup of dressing. I garnished my salad with some hemp seeds instead of croutons and served it with a pumpkin-carrot soup, ginger tea, and a cucumber, berry, beet, & kale smoothie (I told you I loved kale!). Naturally cleansing and detoxing foods FTW! So there you have it! Two simple ways to get out of the SAD and into the glad! All cheese aside, two simple lifestyle modifications can make a world of a difference in how you handle the next winters to come. Are there any other things that you’ve found help beat the winter blues? If so I’d love to hear them! « New Year, Same You? Very motivating! On my way to the grocery store for tahini…your dressing sounds amazing! Thanks. Great! Did you give it a shot?? Can you give some directions for making kale chips? I hear a lot of people talking about them and think I might like to try that for my tv munchie time. Thanks! Kale chips can be a tough one because there’s a very fine line between moist & undercooked chips and burnt & bitter chips. Typically I spritz some torn kale leaves with olive oil & season them with Mrs. Dash or sea salt, then bake them in a pre-heated oven at 350F. I bake them for 11 minutes, just until the edges start to brown. They turn out okay this way, but not perfect. I’ve read that the best way is to mimic a dehydrator & dry them at a very low temp in the oven for a longer period of time. I’ll experiment & share the results! It was very tasty, but a little too thick for me as a dressing. I preferred it as a dip to my raw veggies. I will make it again!